How history is “invented” to suit modern day political agendas was brought out quite unexpectedly in two articles in mainstream media, one of them in Hindi. Audrey Truschke is a US scholar at the Stanford University and her upcoming book “Culture of Encounters:Sanskrit at the Mughal Court” engendered her email interview in The Hindu and the report in DeshBandhu. Would the book come for a BAN in India by Modi Government? We should know the answer shortly. Anything that doesn’t fit the careful narrative arch of Modi’s BJP must be seditious, isn’t it? In an email interview, Audrey Truschke, Mellon postdoctoral fellow in the Department of Religious Studies at Stanford University, shares withAnuradha Raman the experiences of writing her book, Culture of Encounters: Sanskrit at the Mughal Court, to be published in February 2016, and argues forcefully in favour of acknowledging diversity in India. The present Bharatiya Janata Party government believes Mughals are not part of India’s history. Your book is about how Sanskrit, sought to be made mainstream by the government, flourished under the Mughals. How do we reconcile the two? We don’t reconcile the two perspectives. Rather, we ask two key questions. One, who is on firmer historical ground in their claims? Two, what are the political reasons for the BJP wanting to erase the Mughals (or at least most of the Mughals) from India’s past? The bulk of my work concerns the honest excavation of history. The Mughals are a significant part of Indian history, and Sanskrit is a significant part of the story of the Mughal empire. Those facts may be inconvenient for the BJP and others, but as a historian I do not temper my investigation of the past in deference to present-day concerns. However, I realise that history matters in the present, perhaps especially in modern South Asia. One present-day implication of my work is to point up the flimsy basis of the BJP’s version of India’s past. In an ironical way, as the present government fights to push Sanskrit into mainstream discourse, your work concentrates on the Mughals, whom the BJP dislikes, and their engagement with Sanskrit. The BJP only wants a certain version of Sanskrit in the mainstream. They no doubt love Kalidasa, but I cannot imagine the BJP endorsing students to read the Sanskrit accounts of the Mughals written by Jains in the 16th and 17th centuries. India has a great treasure in its Sanskrit tradition, but that treasure is not only classical poetry and the Indian epics, but also the immense diversity of Sanskrit literature. Who were the Mughal rulers under whom there was active exchange of Sanskrit and Persian ideas, in your account? Sanskrit flourished in the royal Mughal court primarily under three emperors: Akbar, Jahangir, and Shah Jahan. However, we should not make the error of attributing Aurangzeb’s lack of interest in Sanskrit to his alleged bigotry. Aurangzeb is a severely misunderstood historical figure who has suffered perhaps more than any of the other Mughal rulers from present-day biases. There are two main reasons why Sanskrit ceased to be a major part of Mughal imperial life during Aurangzeb’s rule. One, during the 17th century, Sanskrit was slowly giving way to Hindi. This was a wider literary shift in the subcontinent, and even under Shah Jahan we begin to see imperial attention directed towards Hindi-language intellectuals at the expense of Sanskrit. Aurangzeb’s reign simply happen to coincide with the waning of Sanskrit and the rise of literary Hindi. Second, as most Indians know, Aurangzeb beat out Dara Shikoh for the Mughal throne. Dara Shikoh had been engaged in a series of cross-cultural exchanges involving Sanskrit during the 1640s and 1650s. Thus, from Aurangzeb’s perspective, breaking Mughal ties with the Sanskrit cultural world was a way to distinguish his idioms of rule from those of the previous heir apparent. In short, Aurangzeb decided to move away from what little remained of the Mughal interest in Sanskrit as a political decision, rather than as a cultural or religious judgment. As a side note, let me clarify that while Akbar inaugurated Mughal engagements with Sanskrit, he did so for slightly different reasons than many people think. Akbar’s reputation is that he was open-minded and tolerant, almost a protosecular figure. This can be a misleading characterisation. Akbar was interested in Sanskrit for its political valence in his empire, not as some personal religious quest. Akbar also had no qualms about harshly judging perspectives that he viewed as beyond the pale. A good example is that he questioned Jain thinkers about whether they were monotheists because to be otherwise would mean being evicted from the Mughal court (Jains assured him that they believed in God). What was the interaction between the Mughal elites and Brahmin Hindus and Jain religious groups like? Brahmans, for example, assisted with Mughal translations of Sanskrit texts into Persian. The method was that Brahmans would read the Sanskrit text, verbally translate it into Hindi (their shared language with the Mughals), and then the Mughals would write down the translation in Persian. Jains and Brahmans alike assisted the Mughals with astrology. Brahmans cast Sanskrit-based horoscopes for the Mughal royal family. On at least one occasion, Jains performed a ceremony to counteract an astrological curse on Jahangir’s newborn daughter. My forthcoming book, Culture of Encounters, devotes an entire chapter to reconstructing the social history of links between Mughal elites and Brahmans/Jains. You argue that the ideology underpinning violence — such as what took place in the 2002 pogrom, in which more than 1,000 Muslims died, or the current intolerance towards them — erases Mughal history and writes religious conflicts into Indian history where there was none, thereby justifying modern religious intolerance. Is it correct to then deduce that there was no religious conflict in the court of the Mughals? No. 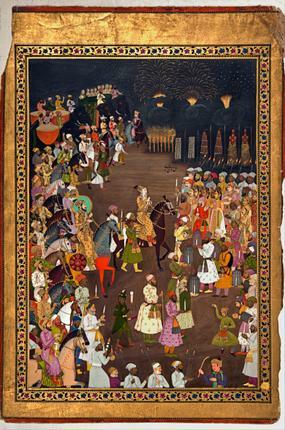 First, there was plenty of violence in Mughal India. Violence and conflict are enduring features of the human experience and I would never suggest otherwise. Even under Akbar, violence was commonplace. A far trickier question, however, is, how much Mughal-led violence was religious-based or motivated by religious conflicts? Generally, the Mughals acted violently towards political foes (whether they were Rajput, Muslim, Hindu, or otherwise was irrelevant). It is very difficult for many modern people to accept that violence in pre-modern India was rarely religiously motivated. In this sense, pre-colonial India looked very different than pre-modern Europe, for example. But we lack historical evidence that the Mughals attacked religious foes. On the contrary, some scholars have even suggested that modern “Western” ideas about religious toleration were, in part, inspired by what early European travellers witnessed in the Mughal Empire. That said, there were limited instances when the Mughals persecuted specific individuals over religious differences. A good example is that Akbar sent a few of the Muslim ulama on hajj to Mecca, which meant that they were effectively exiled from the court. Some of these ulama were murdered on their way out of India. Is there a problem with a Marxist interpretation of history as is being argued now by the BJP government? Marxist history is limiting, in my opinion. This strain of thought tends to emphasise social class and economic factors in determining historical trajectories. Modern historians have a much wider range of approaches at their disposal that better situate us to understand other aspects of the past. Mughal history is such a contentious part of history in the Hindu nationalist imagination. How do you propose to shed light, and create space for a scholarly engagement with the period? It also comes at a time when there is a wave of revisionism in India. My approach is that of a historian. I seek primary sources from numerous languages and archives, read deeply in secondary scholarship, and attempt to reconstruct the most accurate vision of pre-colonial India possible. My work has plenty of present-day implications, but those come secondary and explicitly after the serious historical work. This approach is unappealing to many in modern India (and across the world). It is painstaking, requires specialist knowledge, can be slow, and often leads to nuanced conclusions. But there are also plenty of people, non-academics, who view what is going on in modern India with scepticism. For those who want it, my work offers a historically sound foundation for challenging modern political efforts to revise the past. What are the dangers of rewriting history? So far as the dangers of rewriting history and subscribing to narrow interpretations of specific texts, there are many risks. One is that we risk rising intolerance going forward, something already witnessed on both popular and elite levels in 21st century India. Another risk is that we cheapen the past. India has a glorious history and one of the richest literary inheritances of any place on earth — it would be unfortunate to constrict our minds to the point where we can no longer appreciate these treasures. You argue that “a more divisive interpretation of the relationship between the Mughals and Hindus actually developed during the colonial period from 1757 to 1947”, a legacy that the present Modi government appears to have inherited. But while the British positioned themselves as neutral saviours, who will emerge as the neutral saviours now? In the BJP vision, I believe that the new saviour is the BJP itself and affiliated Hindu nationalist groups that will restore India to its proper, true nature as a land for Hindus. This is an appealing ideology for many people, which is part of what makes it so dangerous. I maintain that India’s greatness is found in its astonishing diversity, not some invented, anachronistic, monolithic Hindu past. Part of the sad irony of the BJP’s emphasis on rewriting Indian history is precisely that India has a deep and compelling history, which so many seem intent to ignore.